Fifth grade teacher Sandi Crozier’s passion for multicultural education has its roots in many areas of her life, from the professional to the deeply personal. As a Japanese American, Sandi has witnessed bias firsthand. Her parents endured the humiliation of America’s anti-Japanese laws during World War II; her mother was interned at Manzanar, and her father was forced to interrupt his studies at California Institute of Technology. He fled by bus to the East Coast and finished his master’s degree via correspondence. Yet Sandi’s Japanese-American heritage and her own multi-ethnic family—she has two daughters who are adopted and a husband who is of Scottish and Irish descent—aren’t the only reasons she is committed to advancing Wildwood’s innovative multicultural curriculum. Sandi says she’s doing it for the students. "Our students are learning how to live in an increasingly global society," she says. "They recognize that their perspective is not the only one, and they are learning to say, 'I see how you can see it that way.'" Sandi started her Wildwood career in the Development Office in 1998 and became a 3rd grade associate teacher in 2002. Six years later, she moved to 5th grade as an associate teacher and soon after was named the 5th grade lead language arts teacher. In her current role, Sandi has developed a curriculum exploring gender and ability, which has led to 5th graders’ increased awareness of their own varied abilities as they develop empathy and connections with others. 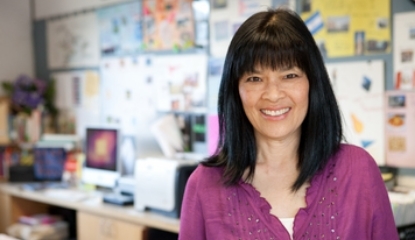 Outside the classroom, Sandi serves on Wildwood’s Multicultural Leadership Team (MLT). The team has deliberately crafted Wildwood’s curriculum to expose students to diverse communities based on family structure, geographic location, language, race, ability/disability, gender, ethnicity, religion, age, sexual orientation, and socioeconomic status. The curriculum is carefully structured to be developmentally appropriate throughout students’ kindergarten through 12th grade experience. Sandi’s influence can be seen in a broad range of MLT initiatives. She co-facilitates multicultural-focused professional development for the elementary faculty and the faculty of color affinity group. She helped create the Guiding Principles for a Multicultural Teaching/Learning Practice, which outlines a collection of best practices related to multiculturalism. She works collaboratively with faculty and administration to consider cultural and institutional practices, raising questions and developing awareness and options to support inclusive practices. And that’s just a partial list of Sandi’s accomplishments. The multicultural curriculum developed by Sandi and fellow MLT members is considered groundbreaking by educators around the country. Sandi and other Wildwood faculty and administrators have presented at various conferences, including the People of Color Conference sponsored by the National Association of Independent Schools. "We are among the leaders in multicultural education because we strongly believe it will make Wildwood students better people," Sandi says. At each conference she attends or presents at, Sandi says she realizes that the depth of Wildwood’s multicultural curriculum genuinely surprises her counterparts from other schools. "When other schools say that our multicultural program is amazing and express how impressed they are by how deliberate and organized our curriculum is, I feel pretty proud," she says.